Rivers that run red. Blinding white landscapes. Cliffs that wave in swirls of orange. No, those aren't works of science fiction. They are wonders of nature that will leave you shaking your head and wondering just how that is possible. The best part? You won't need a spaceship to get there. We've outlined exactly how you can get thereâ€”which in most cases is surprisingly easy. The name says it all. 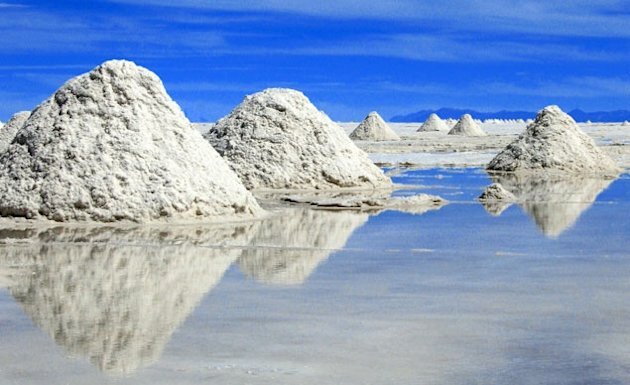 This blindingly white landscape in central Bolivia really is salt. Also known as Salar de Uyuni, the area is said to have been created about 30,000 years ago when Lago Minchin dried up, leaving the salt behind. Today, 10 billion tons remain spread across around 4,000 square miles, where it cracks in naturally occurring hexagonal designs. Go during the rainy season (January to March) and the thin layer of water spread over the flats creates the illusion of a never-ending mirror. 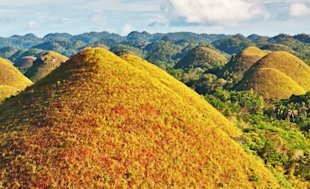 Local lore has it that the mounds on the Philippine island of Bohol were formed from the tears of a giant who fell in love with a local girl. The scientific reason behind the formation of the limestone hills is likely far less romantic (though geologists have not been able to reach a conclusion on the hills' origin). Alas, this is not a Willy Wonka paradise. The name comes from the brown color of the mounds in the winter. If you go in the summer, they will be a vibrant green. Either way, the more than 1,200 conical hills, which vary between around 100 and almost 40 feet high, are a site to behold. 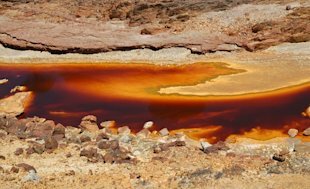 Rio Tinto literally translates to Red River, and it is not a misnomer. The 62-mile-long river does run red and the banks look downright lunar as well. The cause? A combination of rare bacteria, a low oxygen count, and pollution from mining for gold, silver, and copperâ€”which has been going on since 3,000 B.C. The river and landscape in this area of southwestern Spain are so Martian that NASA scientists have studied the composition. 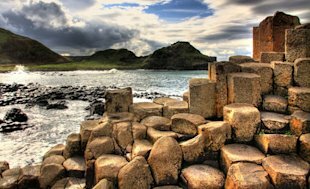 Hike down along the coast at the northern end of Northern Ireland and you'll come across a scene that will leave you scratching your head: Hexagonal stones that stacked along the water like the world's largest Qbert set. There are almost 40,000 of the ballast columns, formed 60 million years ago by magma that spewed and cooled along the coast. Some of the columns reach almost 40 feet high, while others are short enough to walk across. One of the most striking sites is the Giant's Organ, a collection of 60 ballasts more than 39 feet high with three shorter tiers, giving the effect of an elaborate organ. This may be the most psychedelic place on earth. 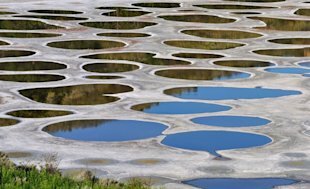 During the warmest months of the year (June through September), the water in this 61-acre lake evaporates, leaving behind rings that make canonical shapes. The high levels of minerals like calcium and magnesium (plus silver and titanium) have the water reflecting blue, green, and even yellow. The lake is a spiritual place for the people of the Osoyoos First Nation and legend has it that the minerals give the water healing powers. Don't even think about filling up a bottle, though. The lake is protected and there is no direct access to the public. While the other locations on this list are amazing due to the landscape, it's the flora on this island 250 miles off the coast of Yemen that makes it so unbelievable. 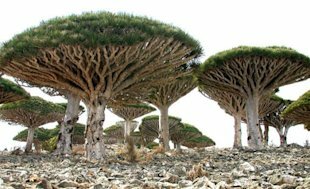 The largest of the four-island Socotra Archipelago, the island has about 250 species of plants that are not found anywhere else in the world. This includes the canopy-topped dragon's blood tree, which has blood-red resin that runs down if the trunk is pierced, and the desert rose, which can grow to 10 feet with a bulbous trunk that swells with water absorbed in anticipation of dry weather. This wilderness in northern Arizona/southern Utah is home to some of the most striking landscapes in the American Southwest, and that's saying a lot. The nearly 300,000-acre site is known for its abundance of colorful shale and Navajo sandstone that been eroded by the elements to create cliffs and escarpments that rise as high as 3,000 feet. 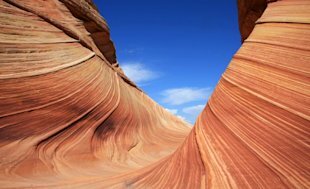 In the northwest of the park is the Coyote Buttes, where you'll find The Wave, a wall of red sandstone that twists and turns in a way that just doesn't look naturalâ€”but is. The immense size of the Perito Moreno Glacier is incredibleâ€”it is more than 50 miles in length and 500 feet deep. The terminus of the glacier is Lago Argentino, where a 50-foot blue-hued ice wall rises from the lake. 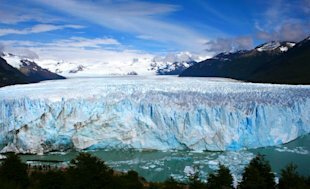 The Perito Moreno is also one of the only glaciers left on earth that is still growing. As it expands it causes a dam in the lake, and when the lake's water wears away at the ice, a giant rupture is caused. The natural occurrence happens every few years. The last one was in March 2012. 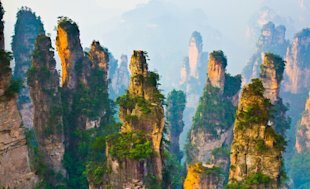 The towering limestone pillars at this park, part of the Wulingyuan Scenic Area in China's Yunnan Province, may look familiarâ€”rumor has it that they were the inspiration for the floating forests in â€œAvatar's" fictitious world of Pandora. There are 3,000 of the jagged columnsâ€”at least one rising more than 3,500 feet in the airâ€”that got their start more than 200 million years ago when seas receded and the limestone landscape took over. Today about 157 different types of trees grow in the forest park (including the rare Chinese dove tree) and the frequent fog that covers the area makes them seem even more cinematic. 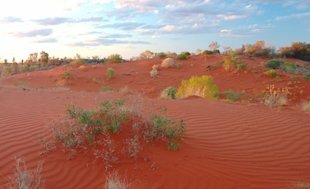 Australia is a large land mass with many extremes, but there is nothing like the Simpson Desert, which lies in a largely uninhabited region near the center of the country. That's because sand that swirls through the 54,000-square-mile desert is a blood red. This is a dunal desert, with linear dunes that can be 125 miles long and as tall as 23 miles. The color comes from iron oxide in the sand, with shades ranging from light pink to blood red. The further you get from area's river channels, the deeperâ€”and more unsettlingâ€”the tone.